The whole package file size has been reduced from 6.12MB to 4.78MB. In addition, the counter has been fixed for recolourists. You MUST delete the old files manually before extracting these files into your downloads folder. They are easy to find: sort the folder by file name and scroll down to 'simt-gourmet....' and delete all of these files. Please note that because there are so many display items in the counters (meaning a fairly high poly count) that I have also produced alongside these a plain-fronted version that don't demand so much from your system. 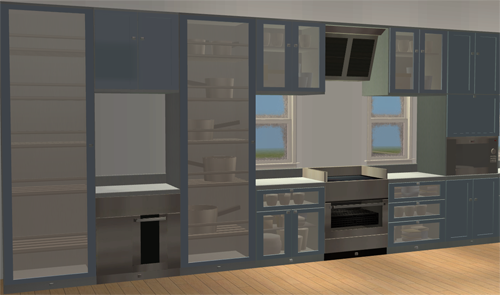 (2)The set includes: counter, counter-fulldoors, counter-noglass, cooker, cooker hood, dishwasher, espresso maker, food mixer, fridge, counter-island link, island, island stool, microwave, sink, tall counter-appliance hutch, tall counter-appliance hutch-no glass, trash compactor, wall cabinet corner, wall cabinet, wallcase-pans, wallcase-racks. (3)The objects are base-game compliant. (4)These objects are compatible with all EPs to date. (5)A collection icon is included to find the set easily in-game. (6)You may recolour (no permission required) and post at any site but you must include a link to the meshes here at MTS2. (7)You may include these meshes in uploaded lots at any web site. (9)All packages were obtained from the original base game objects. All items uploaded in this post have been meshed and textured by Simtomatic. 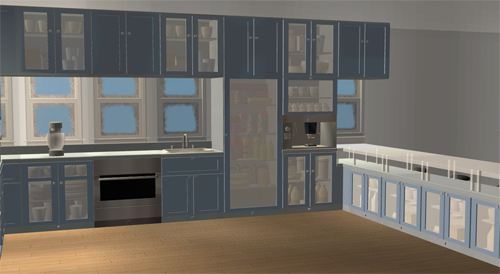 These recolours may or may not be endorsed by simtomatic.